A mural of Saddam Hussein is defaced with the words "Goodbye, leaches," a term the Baathist minister of information, Muhammad Said al-Sahhaf, used to describe U.S. soldiers (Photo: Ramzi Haidar/AFP-Getty Images). Baghdad during Saddam Hussein’s era was littered with panoramas and statues harking back to the glories of early Mesopotamian civilizations, likening Saddam Hussein to the kings of the Akkadians, Sumerians, and Babylonians. The statues of Saddam Hussein have now been pulled down, but Baghdad is still plastered with murals where only his face has been effaced, leaving bare white stone underneath. Nothing has replaced either the man or his face, but with more than 100 political parties there are plenty of pretenders. Baghdad has become a city of graffiti as political parties take advantage of the power vacuum in a country with no elected government, parliament, or constitution. Smaller parties are almost invisible. There are so many of them, with so many similar-sounding names. The United Nasserist Nationalist Party’s headquarters is in an unassuming downtown apartment block—a dusty, grubby affair. On the fifth floor, a group of Arab nationalists sits in a dingy room. They seem to have been sitting there since the 1960s without realizing time has moved on and tarnished the Arab nationalist cause. “The Arab nation has been targeted since the battles of Yarmuk and Qadisiya [early battles of the Arab conquests] and since Islam spread to the east and the west. Today the  Sykes-Picot Agreement [between Britain and France] has split the Arab nation into statelets with manufactured borders in order to abort any unification project,” a pamphlet the party recently printed declares, before making some reasonable points about the need to draft a constitution, to elect a government as soon as possible, and for the all the main political groups to come together for that purpose. Arab nationalists were as duped by Hussein’s Baathists as anyone else, of course. Today, the Communist Party is one of the most prominent in Iraq—an incongruity in the Arab world, where the influence of Islamist ideology has made “communist” synonymous with “atheist”. The communists are officially banned in Egypt. No one with a serious interest in political power anywhere else in the Arab world would publicly take on the “communist” mantle. But in Iraq, the Communist Party has a long history and an important place in the narrative of the emerging modern nation-state—so important that there is a communist on the Governing Council and a communist in the Cabinet chosen by that council. Abdel-Latif al-Saadi of the Communist Party weekly Tariq al-Shaab frankly acknowledges the oddity of having a communist in government in an Arab country, even in traditionally “secular”, Arab-nationalist Iraq. Gradually since the defeat of the secular Arab-nationalist project in the 1967 war with Israel, secularism has become a dirty word in the Arab world. With the continued Israeli occupation of Palestinian territories, and now the American occupation of Iraq, the pan-Arab project has lost its luster. Communism today, Saadi says, is about maintaining the difference between religion and state, din and dawla. Hussein did indeed exploit religion in the 1990s. In the middle of their lost decade under U.N. sanctions, hundreds of thousands of Iraqis sought refuge in God with the state’s encouragement. In 1998, Hussein announced a “faith campaign” that aimed to keep the masses on the straight and narrow in difficult times. Dozens of mosques and religious schools were built around the country, a radio station dedicated to Quranic recitation and teaching started broadcasting in 2001, and rare independent newspapers specializing in religious affairs were allowed to publish for Sunni and Shiite Muslims. The faith campaign also did America and its allies a favor, since it aimed to check the ability of Shiite Iran, Wahhabi Saudi Arabia, or radical groups like Osama bin Laden’s Al-Qaeda to make inroads with Iraqis. The state didn’t want religious extremism seen elsewhere in the region to spread here. Al-Jazairy’s hopes will run up against the rising influence, chiefly among Shiites, of political Islam in Iraq. Iraqi Shiite leaders and factions are many, ranging from the moderate, like Ayatollah Ali al-Sistani, to the radical, like Muqtada al-Sadr, who virtually runs the Baghdad slum of 2 million people formerly called Saddam City and now renamed Sadr City. Two of the moderates are dead: Abdul Majid al-Khoei was murdered in April and Ayatollah Mohammed Baqir al-Hakim in August. Sadr’s hit men are widely suspected in both cases. For all the resurgent influence of political Islam, Iraqis in general still seem mild in their observance of religious occasions. In Baghdad, eating or smoking in public during Ramadan was acceptable behavior. Shiites display pictures of Imams Ali and Hussein on their cars, pictures that are anathema to Sunnis and gross heresy to Wahhabi hardliners. But it is clear that for increasing numbers of Sunnis and Shiites alike, their religious background has become their prime source of identity, pride, and respect. So, Islam is “in” and Arabism is “out” for the standard-bearers of national identity in Iraq. Perhaps it’s not surprising, considering that Islam provided the only accepted outlet for Iraqi’s cultural energies under Hussein. Intellectual and cultural life were destroyed by the Baath dictatorship. Many Iraqi intellectuals sold themselves to Hussein to survive, people like Abdel-Razzaq Abdel-Wahid, who dedicated poems to Hussein on the occasion of his birthday. Abdel-Wahid was notorious among Iraqis. One of the current Culture Ministry officials was a friend of his. “He feels terrible about what he did. He feels he was a traitor to himself,” Hasaballah Yehya says. So terrible that he has left the country and now lives in Paris. Other intellectuals—probably the vast majority—left Iraq during Hussein’s time, while a few chose to sit it out in pained silence. Everything in Iraq is about diffusion and variation. This is “the new Iraq.” Yet that phrase, so commonly bandied by Western politicians and pundits, is almost nowhere to be found in the country itself. After the U.S.-led invasion last spring, the United States set up the new Iraqi state TV and radio stations, known as the Iraqi Media Network (IMN). The first words heard on the network were, “This is the voice of the new Iraq.” The slogan was used for a while. But now—with the constant bombings, the crime, the painful pace of rehabilitating Iraq’s water and electrical systems, and the difficulty of installing electoral democracy—it rings hollow. The press is as free as it is anywhere. It is, in fact, absolutely unregulated. There is no censor. The banishing of Dubai’s Al-Arabiya satellite network aside, there have been few incidences of friction with the Americans. In one case, some papers wrote that U.S. soldiers could see under women’s clothes with their binoculars and that a girl had been raped by a U.S. soldier. In another, a paper urged Iraqis to kill U.S. soldiers and anyone cooperating with them. U.S. reprisals seem to have made Iraqi journalists more careful about their facts. Speaking to many Iraqi editors and journalists, one senses that they are cautious but determined to write what they see as the truth. Many papers use the word “resistance” to describe attacks against coalition forces and international aid agencies, but there is no sense of their being papers of the strident opposition. “The only thing that guides us is the facts,” says Ishtar al-Yasiri, editor of the satirical weekly Habazbooz. The new state TV station is surprisingly bad, though it has improved in recent weeks under new management. A recent U.S. State Department poll found that of the one-third of the Iraqi population with access to satellite dishes, only 12 percent got their news from IMN. Instead, pan-Arab channels Al-Jazeera and Al-Arabiya are gaining ground. The Arab channels regularly host Iraqi commentators, intellectuals, and religious figures who are largely absent from IMN’s broadcasts. The fare during Ramadan—when Arab television stations usually air a light entertainment extravaganza for the captive evening audiences—was poor, a mixture of old Egyptian films, year-old talk shows, a nightly soap opera from Japan. It was not, in fact, much different from the fare during the dictatorship. Too much so, many Iraqis would say. IMN avoids the term “resistance” for insurgents fighting the occupying troops—regularly used by the pan-Arab satellite channels and most Iraqis—preferring “rebellion” instead: “Who says it’s ‘resistance?’ ” Rassam asks. “That’s what Al-Jazeera says. But we are Iraqis—let’s use our own terminology.” Her idea is that the channel should emerge as a semi-autonomous state body like the BBC in Britain. “All Arab countries have state-run media. Iraqis are used to that. But we thought to do something new. If we are semi-state, then we can get funding from the people and the community. That experience is new for the Arab world. The time is right to attempt such a thing,” she says. But IMN appears to be racing against the clock. One private network is likely to be up and running within six months, run by Saad Bazzaz, the dissident ex-Baathist who brought Iraq its popular independent daily Al-Zaman. Bazzaz wanted to use the name Al-Iraqiya (The Iraqi Channel), but IMN and the coalition had taken the name for itself. Though the Shiites are the dominant force in politics now, the Sunni clerics are making their presence felt, too. They marched one Friday afternoon in November in central Baghdad, from a mosque to the main entrance of the Coalition Provisional Authority (CPA). Some 700 men marched in the procession shouting a variety of anti-American and anti-Jewish slogans. “God is Greater, O Baghdad/The army of America will be destroyed,” “Have patience, Baghdad/America the rotten will be destroyed,” and “O Jews, the army of Mohammad will return.” Or the classic, in English, “U-S-A, go away!” When they got to the gates of the CPA they all lined up on the streets in a mass prayer. A small gathering of American soldiers stood uneasily before them. A group of clerics presented them with a petition calling for the release of dozens of respected Sunni clerics who had been detained for several months. An Iraqi journalist hovering around the scene pointed out that when the Shiites stage this kind of protest march they all lie down on the road in front of the U.S. tanks. The great fear on these occasions, and the reason for the media interest, is the possibility of violence if things get out of hand in the morass of cultural misunderstandings, and a U.S. soldier fires in confusion. In this case, a U.S. tank maneuvered itself onto the road, pointing its cannon directly at the protesters. A ripple of tension passed through the crowd. But fortunately the rest of the protest passed without incident. 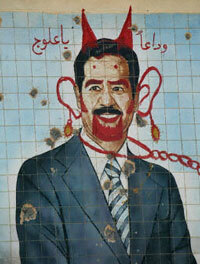 It is easy for a visitor to present-day Iraq to forget how hideous the rule of the Baathist regime really was. Iraqi and U.S. human-rights investigators have identified six major crime periods: the 1983 attacks on Kurds; a 1988 campaign against Kurds; chemical weapons attacks on Kurds from 1986 to 1988; the 1991 crushing of a southern Shiite revolt; the 1991 crushing of a Kurdish insurrection; and crimes committed against all sectors of the population during the entire period of Baath rule. Investigators suspect Iraq has as many as 260 mass graves containing the bodies of at least 300,000 people murdered by the former regime. Wouldn’t it be more fitting for Iraqis to handle the investigation? “Iraq doesn’t have the capability at present to do the work of investigation. The main task for the moment is how to protect the sites which have been opened,” Human Rights Minister Abdel-Basset Turki told the meeting. Turki pointed out that he had asked attendees at the October 2003 Madrid donor conference for reconstructing Iraq for $100 million to pay for equipment and manpower to carry out investigations into mass graves, but that few funds had yet been released. Rafid al-Husseiny was a doctor before he scrapped his medical career to lead the first professional, U.S.-funded, process of disinterring Iraqi mass graves at the Mahaweel site near Hilla, south of Baghdad, where Shiite rebels from 1991 had been dumped en masse, dead and alive. He was a resident of the area who had for years heard the whispers and talk about a mass grave nearby. “Since May, we have been investigating a mass grave of 3,115 people at Mahaweel. We identified 2,115 bodies, which were reburied by their families,” he said. He explained how groups of 40 or 50 men were lined up before huge holes dug in the ground by bulldozers and then shot. The graves were then filled above them. But some managed to crawl out alive and tell the tale, including people who knew Al-Husseiny’s family. “Iraqi citizens must look with both eyes, one looking to the future and one looking toward the past,” he said. It could well be the motto for the mass graves investigation. Driving into the southern town of Nasiriya today, one is struck by the degree to which Shiite iconography has replaced that of Hussein. Paintings, stickers, and murals portray Shiite clerics and saints with a striking Christ-like humility and humanity. Since the war, Nasiriya’s population has seemed reasonably content with the occupation, perhaps because it has a history of opposition to Hussein. It was a center of the rebellion after the 1991 war and, even before the war, photographs of the president were conspicuously absent from most shops around town. So many Iraqis were particularly shocked when, on Nov. 12, suicide bombers hit the base of the Italian military police known as the Carabinieri. The 84 Iraqi injured were at a local hospital, the state of which was as distressing as the sight of the injured. The smell was appalling. Everyone had a different tale about what happened. Some said a car carrying two men entered the parking lot inside the headquarters of the Italian police by the river; others talked about a truck or tanker. Some said the two men in the car had beards in the manner of Saudi Wahhabis. Others said they were clean-shaven. At the bomb site it was clear that the explosion had been huge. There was a crater nine feet deep and 21 feet wide at a distance of about 45 feet from the police building, which was completely destroyed on two of its four sides, with the walls torn off and the insides gutted. Villas directly opposite on the other side of a street some 60 feet wide were ruined in a similar fashion. Those a little way further down the street were a mess on the inside, with furniture and glass strewn everywhere, though the relatively minor damage on the outside suggested the residents might have contributed to the damage in the hope of a compensation payout at some stage. Windows on the other side of the river had been blown out by the force of the blast. Townspeople were shocked and annoyed. Many blamed the Italians for being a target simply by being there and for not being very strong on the security front. “They were very nice but quite useless,” one 17-year-old kid put it. The strategy of the Italians had been to portray an open, friendly image to the townspeople, in contrast to the tough attitude of the Americans. For two days after the bombing, Italian brass, including the defense minister, turned up for whistle-stop tours of the site. They made speeches defending Italian security measures, promising to stay, and portraying themselves as victims of terrorism alongside the Americans. November 2003 was the bloodiest month of the Iraqi conflict for U.S. and coalition soldiers. On Nov. 12, the same day that suicide bombers attacked the Italian base in Nasiriya, CPA chief L. Paul Bremer III was called back to Washington for urgent consultations. The Iraq adventure was threatening to become an issue that could count against U.S. President George W. Bush in his reelection campaign. Masking the very obviously American nature of governance in Iraq had become a top priority, especially since the Iraqi Governing Council had made little progress on drafting the constitution that was supposed to lead to the elections that would allow Iraq to declare itself free and sovereign. Three days after Bremer’s hasty trip to Washington, Kurdish leader Jalal Talabani, Chalabi, and four other council members appeared before the press corps in Baghdad to reveal the new plan from Washington and the council. The idea was to skip the constitution and elections, which were obviously major sticking points requiring more time to sort out, and set up a government that would be as close to being popularly elected as possible without actually being popularly elected. The Governing Council would organize coordinating committees composed of tribesmen, political parties, and religious leaders from around the country to nominate candidates for a transitional assembly, which would then elect the members of a new government from its own ranks by the end of June. Though the U.S.-led coalition would still be responsible for security, the new Iraqi government would be the first independent government since the fall of the Baathist regime. Its formation would mean the formal end of the occupation, which would then become an American “presence” at the invitation of Iraq. Big ideas and noble talk. It sounded like a plan, something that if all went well could guide the country out of its mess. The Governing Council clearly has its work cut out for it. Among other things, it will have to rally all sectors of Iraqi society in all the governorates of the country. This, bear in mind, is a council that has so far singularly failed to form any bond with the people. Its members are absent even from their own state television station. Meanwhile the security situation, if it doesn’t improve, is going to make this national process difficult, if not impossible. One taxi driver’s reaction to Washington’s new exit-strategy—“That gives them six months to finish looting the country”—seemed to capture the popular mood. The most striking thing about seeing the six council members appear at a press conference to announce the new plan was simply seeing them. Normally they were nowhere to be found. Later that evening an Iraqi political analyst told the BBC World Service that in Iraq there was no middle ground, you were either with the quisling Governing Council and the Americans or you were with the resistance and the terrorists. Those words rang very true. Television has done nothing to foster or create or provide a forum for that absent middle ground. The press is still young and cautiously feeling its way. For all the noise, there is no public discourse, in any meaningful sense, at all. Do Iraqis like to complain too much? Many journalists and other foreigners here privately say so. A stifling, cruel dictatorship is no more, the lid has been lifted on expression, and yet there is little sense of relief or joy. Returning to Iraq for the first time since the war, I had expected the initial euphoria and surprise to have died down, but, like other foreign journalists in Iraq, I still expected to find that Iraqis felt some sense of relief. Perhaps we underestimated how much the experience of life in Hussein’s Iraq—a country which was personalized as virtually his own private property—had destroyed the people’s spirit, as the Minister of Culture and Iraqi journalists suggested. Perhaps it was also something to do with a fundamental misunderstanding about the way a dictatorship works. The dictatorship didn’t seem to be something bad that had visited itself upon Iraqi society then lifted like a bad cold. The dictatorship lasted because it knew the strengths, weaknesses, fears, and cracks in Iraqi society. It lasted because it formed some sort of vision for uniting a country of huge diversity. Those fears hadn’t gone away because they were based on real fissures in society. It will take time for Iraqis to get used to each other in this new environment and to learn not to fear what the Sunnis, the Shiites, or the Kurds might want to do. One Iraqi journalist was convinced that Iraq will see even more bloodletting in 2004. Only then, he said, will Iraq manage to get on its feet and advance as a country. A few facts argue for this pessimistic scenario: the Governing Council appears weak and frightened of discussing serious issues like the writing of a constitution; many potential leaders don’t want to get their hands dirtied by power and dealings with the Americans at this stage of the game. Many Iraqis—mostly people who did well in one way or another under the old system, whether Baathists or not—argued that if Hussein came back to power the country would sort out its problems with law and order. Hussein knew his Iraqis, and he knew how to make them afraid. On Nov. 21, only a few days after the message in Al-Hayat, I awoke to the window of my hotel room shattering. Iraqi resistance fighters had fired rockets at the building from donkey carts. No one was seriously hurt. It was a minor incident in a country that has seen decades of violence. The danger of Iraq had become so much background noise. One night, while I was sitting in a restaurant, gunfire erupted across the river. The management turned on some music to drown out the noise. We all carried on as if we had heard nothing. But then the shots seemed to get closer. It seemed there was fighting in all the nearby streets. I wondered how I would get back to my room. But at the hotel reception desk, it was all smiles and soccer. Everyone was happy because Iraq had defeated North Korea, so happy that they were firing weapons in the air. All for victory over a country that was part of the “axis of evil,” which Iraq seven months before had left behind.